To measure the anticonvulsant effects of a course of electroconvulsive therapy (ECT), we used a flexible stimulus dosage titration procedure to estimate seizure threshold at the first and sixth ECT treatments in 62 patients with depression who were undergoing a course of brief pulse, constant current ECT given at moderately suprathreshold stimulus intensity. Seizure threshold increased by approximately 47% on average, but only 35 (56%) of the 62 patients showed a rise in seizure threshold. The rise in seizure threshold was associated with increasing age, but not with gender, stimulus electrode placement, or initial seizure threshold. Dynamic impedance decreased by approximately 5% from the first to the sixth ECT treatment, but there was no correlation between the change in dynamic impedance and the rise in seizure threshold. No relation was found between the rise in seizure threshold and either therapeutic response status or speed of response to the ECT treatment course. 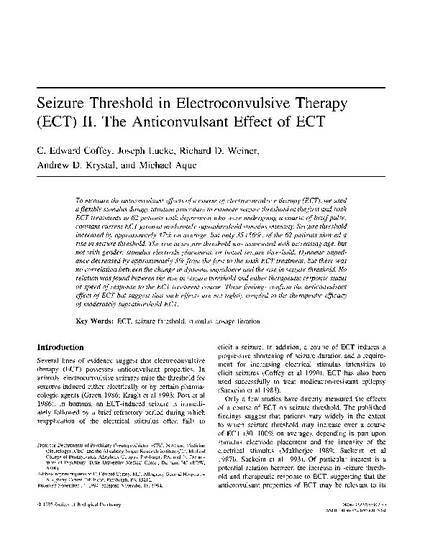 These findings confirm the anticonvulsant effect of ECT but suggest that such effects are not tightly coupled to the therapeutic efficacy of moderately suprathreshold ECT.